Niklas Gunnarsson has been enjoying soaking up the sights of Scotland’s capital, but while the defender, who joined Hibs on loan during the January window, loves the architecture and the history, he claims that one of the highlights was seeing the jubilant Easter Road crowd after the recent Scottish Cup win over city rivals Hearts. On loan from Norwegian side Valerenga until the end of the season, he does not know what it is like to see his temporary employers defeated. 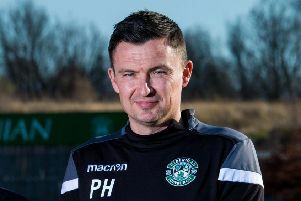 Since arriving at the club at the start of January, he has watched them advance to the final of the League Cup and played his part in helping them progress to the quarter-finals of the Scottish Cup. But he believes they can also keep the pressure on Rangers in the chase for the Championship title and says the crowd and impassioned singalong after the derby offered a glimpse of the rewards a return to the top flight could bring. The 24-year-old, who can play anywhere along the back line, has made four appearances for the first team and is vying for even more game time as the treble quest approaches its denouement. Tonight Hibs have the chance to make their game in hand on the leaders, Rangers, count for something as they welcome Morton to Leith. Three points would close the gap to just five and leave the Ibrox side little margin for error. The Norwegian, who dabbled in martial arts before deciding that football was his preferred option, has a fighting spirit. He’s also a smart cookie, conversing easily in a second language. But it is his performances on the pitch that will influence whether Hibs fight to make his move more permanent in the summer. Gunnarsson, though, seems to have a healthy appetite for staying in Edinburgh. “If I get a day off I like to walk around Princes Street or George Street, maybe head up to the castle,” he said. “I’ve walked around Arthur’s Seat but it’s too cold to climb it. I love the architecture and it’s a beautiful city. I’ve been recognised a few times, which is funny. I met one fan walking into Holland & Barrett . Some experiences need to be savoured to be believed.